The first few holidays after having a baby bring a whole new level of excitement — and exhaustion. Navigating family obligations, attending parties and completing your seasonal to-do list can all feel a little more overwhelming than usual. After all, you're busy taking care of a tiny human now. 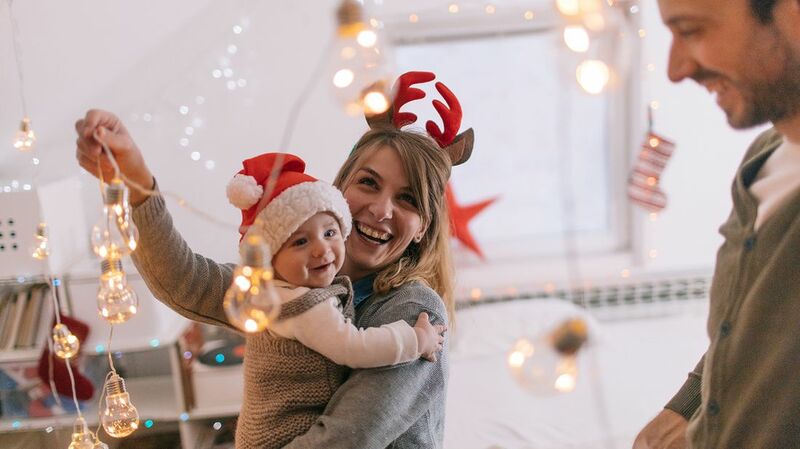 By giving yourself permission to do less and strategizing in advance to make the holidays more special — and less stressful — you can better focus on making lasting memories with your little one. Here's your new parent’s guide to surviving the holidays. Babies don't care about gifts. In fact, they're usually happier playing with the wrapping paper or discarded boxes than the presents themselves. Fight the urge to buy your babe all the things until he or she is old enough to understand the concept. Family members, however, will likely still want to give gifts. When others ask what to get for baby, set some boundaries — without stealing anyone's present-giving happiness, says Justine Haemmerli, who runs Girls Gone Happy. 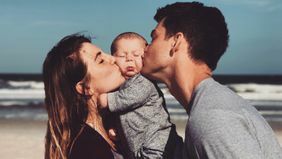 "For our 11-month old baby's first holidays, we made a rule that family members could get her anything that made them happy, but if they purchased a toy that made noise, it would stay at their house," she says. "Everyone was satisfied — they got to enjoy giving presents, she liked playing with them, and we were happy to return to our quiet house where she resumed her fascination with Tupperware containers and spoons." You're allowed to have some alone time to do the things that matter to you. Haemmerli adds that if you feel strongly about what your child receives — like no toy weapons, for example — make those guidelines clear, too. While family members will likely all want time with you (or rather, your baby) during the holidays, remember that you're allowed to have some alone time to do the things that matter to you. 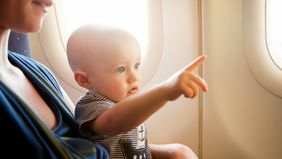 "You can find yourself shuttling from one event to another, partaking in everyone else's traditions and then realizing once January rolls around that you never got to go take the 'baby's first holiday' photos you daydreamed about when you were pregnant," Haemmerli says. Pick one or two things that you, baby and your partner would like to do just as a new, little family. Friends and family are likely to understand — some might not even notice your absence. Plus, checking off your own holiday musts first will make going to everyone else’s parties more enjoyable. Chances are your parents and in-laws will have different ideas of what they think is acceptable for your baby than you do. Determine your boundaries and communicate them to avoid conflict. "Perhaps you're OK with your nugget staying up past bedtime, but absolutely don't want anyone sneaking her pie and cookies," Haemmerli says. "Whether it's rules about sleep, food or other habits you feel strongly about, take some time before the festivities begin to name what you're willing to bend on, and what you're sticking firm with, even when schedules and patterns get wonky." There's no need to be a martyr if you're hosting a holiday event, says Maria Lianos-Carbone, author of Oh Baby! A Mom’s Self-Care Survival Guide for the First Year. As a new parent — or for anyone, really — it's OK to ask others to pitch in. "If you’re hosting Christmas dinner, tell everyone it’s a potluck and to bring a dish," she suggests. And if you've always been the one with the best-decorated house or who typically organizes the annual holiday bar crawl for friends, enlist help. When your baby is older, you can add more back onto your plate. 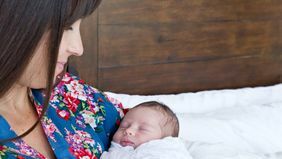 Finally, know that holidays with baby may be far different than what you've experienced in seasons past, where your calendar was crowded with friends- and family-filled events, after which you could sleep in and recover until the next one. There's no need to run yourself ragged — and blow your budget on babysitters — trying to make every single social engagement. "You don’t have to attend every party," Lianos-Carbone suggests. "Choose one or two and gracefully decline the other invitations." Your sanity will thank you.